Una curiosità: il re Kamehameha II aveva una casa di vacanza in Ewa Beach. Egli ha anche estratto il sale vicino a White Plains in Kanehili. Godetevi il comfort di un privato, casa sulla spiaggia a Ewa Beach Road. Ewa Beach Road ha una piccola, sonnolenta atmosfera da spiaggia-città. Osservare gli uccelli in via di estinzione, Sealife, e la flora dal prato o sedersi con i sandcrabs sulla spiaggia. Trascorrere del tempo la famiglia di qualità nascosto in un tradizionale casa sulla spiaggia ben arredate,, sulla soleggiata Ewa Beach Road con la comodità di centri commerciali, banche, ristoranti (preferito è di Russo pizze a carbone), e Hoakalei Resort solo un miglio di distanza. Prendi l'esperienza locale e hanno Karen, il vostro ospite, vi mostrerà macchia da nuoto preferito da tutti. Può mostrare gli uccelli che lei salva e ti dirà dove andare a vedere antiche rovine. La nostra esperienza locale include l'ukulele che gioca a fare i vicini, guardandoli pescare, rilassarsi nel patio al tramonto e percorrere chilometri di litorale naturale. Concediti una cena romantica al tramonto sotto l'ombrellone nel patio. Aiutati al rosmarino. Fanno ottimi spiedini per il barbecue. La cucina è dotata di forno a microonde, forno tostapane Breville, porcellana, cristallo, pentole, caffettiera, tostapane, frullatore, ecc. Tutte le camere sono dotate di ventilatori a pavimento e soffitto. Ci sono giocattoli da spiaggia nell'Hale Menehune (piccolo capanno). La camera da letto principale a nord ha un comodo letto matrimoniale e sistema di controllo del clima Bedjet. La camera dei bambini a ovest ha due letti singoli. La camera da letto a sud-ovest ha un letto queen-size e sistema di controllo del clima Bedjet. La proprietà è recintata per garantire la sicurezza e la privacy. È possibile aderire al centro eccitazione o sedersi sul prato spiaggia e godersi le luci della città di Honolulu. Il punto di vista di Diamond Head è ostruita. Le albe sono calde e meraviglioso. I tramonti colorati sono rilassanti e la luna è causa per la canzone. Venite preparati per il sole o interrompere in qualsiasi dei negozi convenienti lungo la strada per la protezione solare. Anche i cappelli e gli indumenti SPF sono incoraggiati. Mentre sei qui, sei nostro ospite e quando vai via, non chiediamo ai nostri ospiti di fare il bucato, quindi vieni a rilassarti e divertirti. Hai qualche domanda, per favore non esitare a chiedere. Spero di vedervi presto. Di proprietà e gestione cristiana, non è permesso fumare sulla proprietà e lo Stato non consente di fumare sulla spiaggia. Più di 2 milioni di mozziconi sono stati trovati sulle nostre coste costiere in un giorno di pulizia. Questo è il doppio della quantità di confezioni di cibo e contenitori trovato su quel giorno. I nostri uccelli costieri mangiano i mozziconi e muoiono di fame. Abbiamo bisogno di intensificare e aiutare il nostro ambiente per essere in grado di continuare ad essere il paradiso tutti gode. Uno nella camera da letto matrimoniale e uno nel corridoio di fronte alle camere da letto. We really enjoyed our stay with Karen. She ahd everything we needed. We are a very large family with young rambunctious kids. I found myself telling them to be quiet most of the time. I recommend thia place to anyone who wants to enjoy the true Hawaii! The beach is wonderful and never busy. A swimming hole is available nearby. We were able to see seals on the beach twice during our stay. Sunsets are beautiful. Lovely night views of Honolulu. Located centrally for our touring around Oahu. Couldn’t ask for a better equipped property, inside and out. Karen and her family were very kind and welcoming and helped us whenever we asked for anything. We would definitely stay here again. Perfect for visiting with family and friends. Lovely home, host and view! Our family of 5 just returned home after spending 7 nights in Karen's lovely cottage. It is an older home, in an older neighborhood. With a stunning view right from the back lawn. The home is very private with a fully stocked kitchen, plenty of towels, fans, games, and books. A whole shed full of beach tools! There is even a shower bench and grab bar in master bathroom for elderly/disabled. We fully enjoyed watching the sunrise near Honolulu then the sunset to the west. Mahalo Karen! Words cant say enough for how wonderful our vacation was here. The house was clean and with every amenity that you could imagine. My grandfather kept repeating over and over how much he enjoyed the house instead of a stuffy hotel that pushes their overpriced food and gift stores at you. It was everything I dreamed of. I bought water shoes for my family and there was even those at the property as well. We left ours there as well so hopefully others can use them. Karen and her husband were so nice and helpful, but you have all the privacy in the world! We are looking at already planning our next trip in 2 years. We can't wait to see you again Karen!! Location, cleanliness, hospitality and a relaxing rejuvenating atmosphere! To celebrate my fathers 90th Birthday and Thanksgiving we stayed at friendly, low key beach house in Ewa Beach. With views of Diamond Head / Waikiki to the east and Barbers Point to the west this house had all spectacular sunrise and sunset views from the back yard. 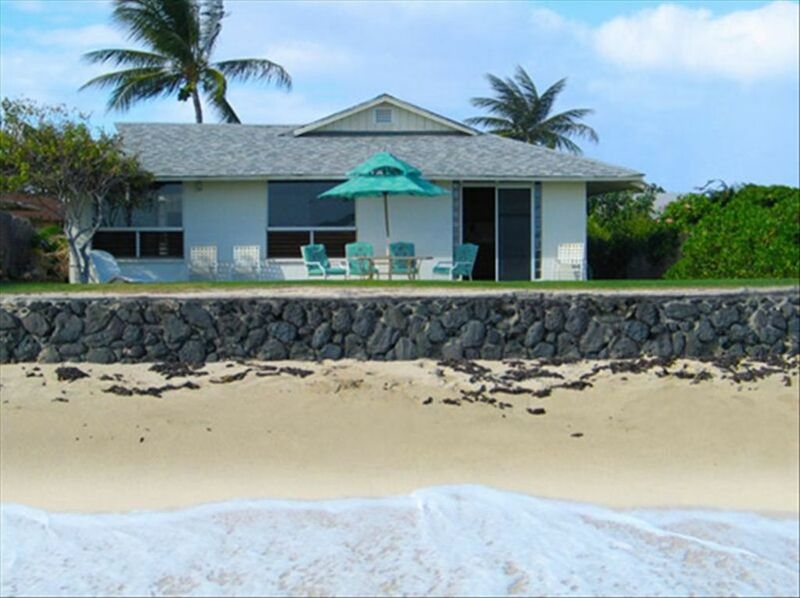 The beach is directly behind the house with sandy access to the coral bottomed ocean. The home had just about everything we needed to prepare our meals since at the house. Access to shopping was only a few minutes drive away including a Costco, Foodland Supermarket, Safeway as well as the Commisaries on Hickman, Schofield Barracks, Barbers Point .... We have family and friends here so luvkiy dining out became just about unnecessary. The property has a full kitchen complete with a 4 burner electric cooktop, electric oven, microwave, large toaster oven , rice cooker, stand mixer and even a Vitamix Blender! Full fridge freezer and ample storage easily handled all the supplies we needed for an 8 day stay. The central location ensured we were no more than 30-45 drive to just about anywhere on the island. If you want a relaxing environment where the beaches aren’t all packed to gills with people or there isn’t an ABC Store in site this place is for you. After spending an afternoon, evening in Waikiki you’ll appreciate the laid back atmosphere of this property. The backyard has trees and bushes to provide ample privacy on both the left and right side of the yard. There is also both a gas and charcoal BBQ grills, nothing like a BBQ at the beach that just happens to be your backyard!!. Karen the owner is as friendly as could be as well as very respectfully professional about her property. No detail went unatteded, she even ensured there was ice in the freezer!! Plenty towels for bathing as well as beach towels were readily available. She also had a storage shed full of beach activity items, body boards, surfboards, masks, snorkels, fins and importantly reef shoes (make sure you bring your own though, that coral underwater bottom can tear your feet, ankles and legs up if you’re unprepared, The rooms were comfortable with both ceiling fans and room fans the breezes cooled the rooms off nicely! Could not ask for better spot for a family centered relaxation destination. Recharge your bodies batteries here, you will not regret the choice. Thank you for everything Karen, it was a wonderful, memorable stay!! Golf, Pearl Harbor Arizona Memorial, Acquascivolo, Ewa Train Ride, Ko'Olina, Waipahu Plantation Città, Sentieri per escursioni, Westlock Shoreline Park, giardini botanici e parchi Beach. Chiedi a Bill, il nostro vicino, su golf, Ha giocato su tutti i corsi.